Open wide and say ahhh. You haven’t heard that in Second Life yet. Bet you haven’t received dental care here either. That could change because your future dentist may be here now, filling virtual cavities. Students at the University of Maryland – Baltimore Virtual Dental School will have the opportunity to study and train at a new campus, opening later this year. The concept is new as UMB is the first such school to offer dental training in cyberspace. Other real world talents contributing to cyber world success include Julie Gilliam, MS – instrumental in the online school’s technical development and Dean Christian S. Stohler, Dean of UMB. He is credited with the foresight in funding the virtual site’s development. Consultations, case studies, classes, lectures and more can be conducted from real life dorm rooms, doctor’s offices and living rooms. The physical location doesn’t matter to avatars – even those becoming future dentists. The University of Maryland-Baltimore’s second life is a lot like its first one. But unlike the 9 floor facility in downtown real life Baltimore, the virtual presence is situated on 3 levels. The latter has pixels; the former, Novocain. Both are red brick and glass and both are state of the art dentistry. But the coolest area is the second floor clinical area. From here perhaps one day soon a receptionist may say “The dentist will see you now.” Step in to the next area and there are fully furnished examination rooms, complete with dental instruments, computers and the obligatory reclining dentist chairs. It is so realistic I wanted to rinse and spit. “But virtual dental training is an additional educational tool, one of many” cautioned Dr. Trotman. “It is not a substitute for real classrooms.” In other words, you won’t have a root canal from a dentist previously treating avatars. Virtual UMB has three goals: 1 – Allow more collaboration between students and faculty. There are comfy cyber chairs and tables throughout the site where future dentists can meet informally with each other or their professors. 2 – Provide another tool for teaching, with emphasis on ‘another,’ not a substitute for traditional training. The school has a lecture hall with seating for about 70. The facility is equipped with streaming video, power point presentations and other teaching aids that rival those of real life schools. 3 – Second Life simulate real life scenarios. The dentist offices have case studies for role playing opportunities. Avatars receive hands on training from diagnosing symptoms to dealing with disgruntled patients. But this is Second Life – a vast frontier known for providing just about everything but dental health. What keeps the university’s students from flying around the room or, during the middle of a lecture, teleporting to a parallel universe? Not here. Codes of behavioral conduct and appearance are strictly enforced. A patient may ask for a second opinion, but not because his avatar dentist had a fox tail and bat wings. Floor Three houses exhibits from the National Museum of Dentistry. There are interactive displays, artifacts and stories from dental history. My favorite is a presentation about George Washington. The father of our country had bad teeth, which may explain why you never see a picture of him smiling (look at him on the dollar bill. See? Told ya). The museum is in the developmental stages but there are photos of early dental instruments back from when treatment was sometimes as bad as the disease. But the centerpiece of the museum is a mannequin suspended upside down from the ceiling holding a very heavy weight with her teeth. Don’t try this at home. Founded in 1840, The University of Maryland-Baltimore is the oldest dental school in the US. Their virtual school is one of the newest. Both meld as one for the latest technologies in dental care – avatar and/or human. It was a great visit seeing this cutting edge dental center. Can’t wait unit my six month check up. Visit http://www.smile-experience.org to see more objects and exhibits from the National Museum of Dentistry, located in real life just blocks away from the dental school on the University of Maryland Baltimore campus. Thanks so much for the comment and great link! Yet another proof that I was born too early. Great article. http://thedentalassistant.com .Click on the link above to get all the information you need about becoming a dental assistant. I always enjoy reading about innovative ways in which technology and especially cyberspace is being incorporated into our lives in an enriching way. I look forward as we as a human race continue to learn how to fully harness this amazing tool that we have created. Keep up the good work! It is quite remarkable at how far technology has influenced the dental field. Thanks for sharing this post. 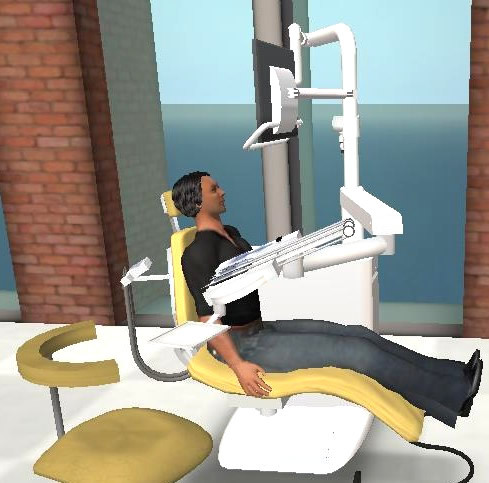 is there a link for the dental training in second life? ?